At a time when the growth of the Russian economy is slowing down, Elvira Nabiullina, who took charge of the Central Bank a little over three months ago, has set ambitious objectives — to target inflation and to stimulate growth by attracting investment. The U.S. Congress is due to vote before the end of the year on the candidacy of Janet Yellen, who was nominated by President Obama for the position of chair of the Federal Reserve System. If Congress approves her appointment, the 67-year-old Yellen will become the first woman to head the Federal Reserve System (FRS) in its 100-year history. Since the end of June 2013, the banking system in Russia has also been headed by a woman — the former minister for economic development and President Putin’s economic adviser, Elvira Nabiullina. In her current post, the 49-year-old Nabiullina replaced Sergei Ignatiev (head of the Central Bank since 2002) after his third and final term in office came to an end. 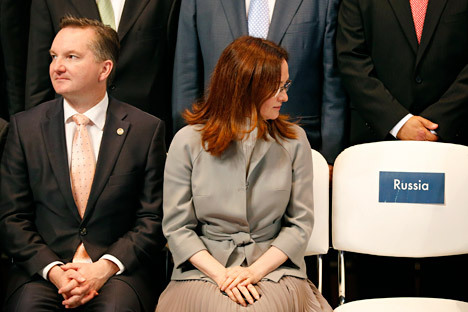 Many specialists pay tribute to Nabiullina’s excellent theoretical background and solid managerial experience, while also acknowledging that she has come to be head of the Central Bank at a very difficult time for the Russian economy. According to a forecast from the World Bank, growth in Russia’s GDP will slow from 3.4 percent in 2012 to 1.8 percent in 2013. One of Nabiullina’s main priorities is to tackle inflation, which, according to figures from the Russian Federal State Statistics Service, stood at 6.6 percent last year. “We are expecting inflation to be at 6 percent at the end of this year, and reducing this still further by 1 percentage point over the course of the next year is very realistic,” said Nabiullina. This is in line with Vladimir Putin, who set similar objectives in a speech at the Rossiya Zovet investment forum at the beginning of October. In order to combat inflation, the Central Bank is switching to a policy of inflation targeting. “The Central Bank has the potential, by setting interest rates, to reach a point where inflation is decreasing,” Nabiullina said. Aside from lowering inflation, the Central Bank is able to influence the stimulation of growth in the economy. According to Nabiullina, investments with relatively long repayment periods, which are designed to raise labor productivity and the competitiveness of the economy, should drive growth. Last year, the influx of direct foreign investment was reduced from $55 billion to $51 billion. Experts note that any improvement in the investment climate depends, first and foremost, on the quality of the institutions, faith in government bodies, and how attractive the country appears from the point of view of legal transparency and the rules of the game. “We do not have much room to maneuver in this respect, although, in macroeconomic terms, we are in 29th place—that is to say the best out of all the G8 countries. If we are to climb up to 22nd position in the macroeconomic rating with Nabiullina’s help, but remain in 122nd place out of 148 countries in terms of faith in our law enforcement, we are not going to make the investment climate any more attractive,” says Mironov. Another key direction in Nabiullina’s work is to encourage faith in the Russian banking system. Markelov of Investcafe expects that Nabiullina — in contrast to Sergey Ignatiev, who increased the market share for state banks — will improve portfolio credit ratings and the position for private banks. In Nabiullina’s own words, the Central Bank has identified two categories of problem banks, and it has focused its efforts on working with them. These are banks that are making suspicious cash withdrawals and sending the money overseas, and also banks that are not sufficiently stable and are investing ordinary people’s or company money in high risk projects. The Central Bank is planning to revoke the licenses for the first category, while, in the second category, the owners will be offered a 6-month financial re-organization program. In problematic cases, this could take a year. Since September 2013, the Central Bank has been a so-called mega-regulator. In addition to controlling the banking sector, it has been given powers on the authority of Vladimir Putin to oversee the financial markets. This was previously the responsibility of the Federal Financial Markets Service.